During one scene in Bon Ishikawa’s upcoming documentary “Sekai de Ichiban Utsukushii Mura” (“The Most Beautiful Village in the World”), the photographer-turned-filmmaker uses a drone to capture one of Asia’s oldest traditions: the collecting of honey from caves in the steep cliffs of the Himalayas. The local Gurung people have been practicing the custom for hundreds of years, but they were forced to discontinue it on April 25, 2015, after a magnitude-7.8 earthquake devastated Nepal. Including the honey harvest in his film, Ishikawa offers an encouraging position: Tradition survives, and it’s all thanks to community. Early on in the documentary, however, things don’t look so bright. One especially moving scene focuses on Yam Kumari, a nurse from the mountain village of Laprak whose husband was one of the nearly 9,000 who died in the quake. Teary eyed, she confesses that the circumstances have caused her to lose her faith. It was a sentiment felt by many of the villagers, according to Ishikawa who spent more than 18 months filming the area. Ishikawa, 56, was born in Oita Prefecture but moved to Tokyo at age 16 to fulfill a childhood dream of being a professional shōgi (Japanese chess) player. However, he ended up as a staff photographer for Agence France-Press before becoming a freelance photojournalist in 1990. He has documented a wide variety of events and subjects, from traditional fishing practices in Indonesia to the Great East Japan Earthquake of 2011. When he boarded a flight for Kathmandu in the aftermath of the Nepal quake he brought experience as well as a keen eye. He took as many emergency supplies as he could carry, knowing that there would be greater need for them the farther he ventured off the beaten path. Ishikawa headed to the quake’s epicenter northwest of Kathmandu, and the crumbled mountain roads forced him to trek for a day before he could reach Laprak, which is located in Gorkha District at an elevation of 2,500 meters. He wandered among the ruins of the devastated community, many of its 600 dwellings reduced to piles of stones, dried mud and bamboo shards. A 90-minute trek away from the devastation of Laprak, the photographer found himself in a makeshift refugee camp for the village’s residents farther up the mountain. They were living in primitive tents, with nothing more than plastic sheets to shelter them from the elements. 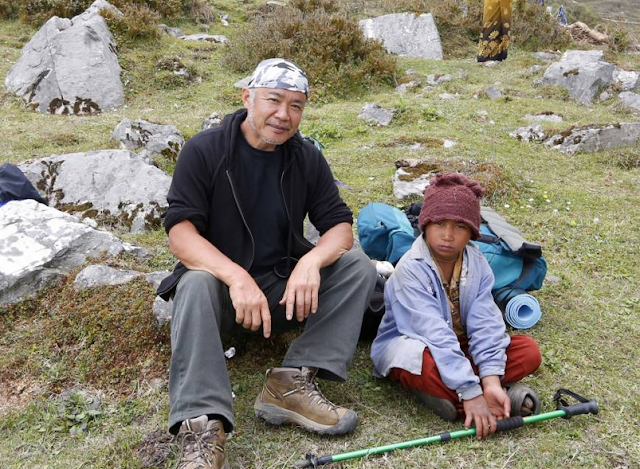 In the camp, Ishikawa met Ash Bahadur, a spunky and lovable boy from an impoverished herding family who lost everything in the disaster. His younger sister was injured in the quake and had been sent to the town of Pokhara, three hours away. Ishikawa saw the community rally around Ash and his family and it affected him deeply. “It made me quite nostalgic, reminding me of something we once had in Japan when I was a child,” he says. Ishikawa told Ash he would tell others of what happened to Laprak and promised to return. He kept his promise and on his second trip he brought along around 3 tons of supplies, and hired local residents to help deliver them to those in need. “I saw this as an opportunity to not only provide much-needed aid, but also provide work for those who had been most impacted by the quake,” Ishikawa says. The villagers were paid with funds accrued by a campaign on Ishikawa’s Facebook page that were also used to purchase the relief supplies. He raised around ¥5 million through crowdfunding, which he then matched through his own savings. He later uploaded photos and videos of residents offering their thanks to those who had donated. Ishikawa wanted to do more, too. Dissatisfied with the “one shot” impact of the news images he had supplied to magazines and newspapers, he searched for another avenue that would ensure continued support for the villages he encountered. That led to the decision to make a film. The film came together over seven subsequent trips to Nepal. Ishikawa documents the aftermath of the earthquake, but does so in a way that focuses on the triumph of community instead of anything resembling so-called disaster tourism. He has entered his film into several international film festivals, including the Berlinale and Toronto’s Hot Docs. Along with the honey collecting, he was also able to shoot a harvest festival in which girls perform a trance-like dance known as the Ghatu, an ancient part of a Tibetan religion called Bon that is practiced by the Gurung. The return of the festival marked a significant milestone for the local villagers in their quest for recovery, according to Ishikawa. “It was the first time since the quake that people had smiles on their faces, the first time that they actively sought peace with their God,” he says, adding that many families made traditional offerings of goats while young Ash’s family was only able to offer cucumbers as an oblation. Nurse Kumari, who had previously suffered a crisis of faith, also attended the religious ceremony. She has spent each day going back and forth between the camp and Laprak, where she tends to the elderly residents who were unable to relocate or chose to stay there. “Sekai de Ichiban Utsukushii Mura” will premiere at Togeki theater in Chuo-ku, Tokyo, on March 25. For details, call 03-3541-2711 (Japanese). The film will also be given special screenings at Iwaki PIT in Iwaki, Fukushima Prefecture, on Feb. 4 (0246-38-3836); and Kamaishi PIT in Kamai, Iwate Prefecture, on Feb. 26 (0193-27-8751). For more information, visit www.himalaya-laprak.com.